Tags are short textual labels that can be attached to studies in order to mark them as having certain properties that are important in billing. For example, you can add a tag to studies that are missing a referring doctor or a diagnosis code. 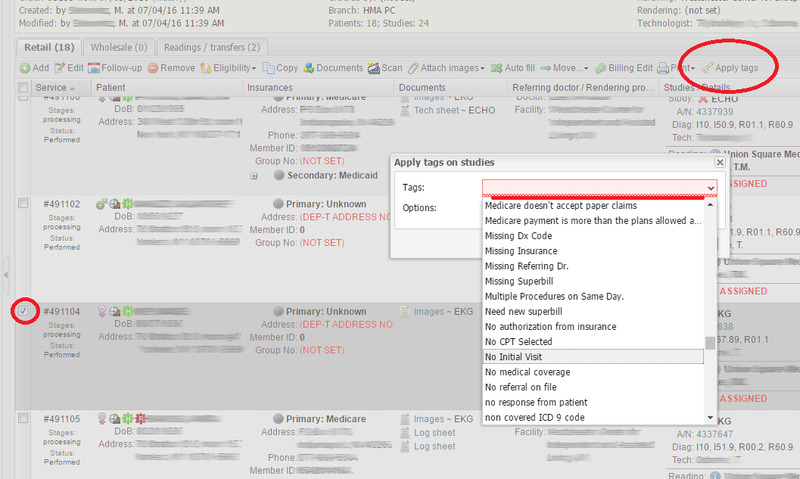 Then you can find the studies that have specific tags using the Billing module. 1. Select one or more services. 2. Click the apply tags button. 3. Choose the tags you need to add from the drop-down list. You can select multiple tags. NOTE: Administrators can modify the list of available tags by going to SETUP → BILLING → TAGS. 4. Choose Save existing tags to preserve tags that were previously added to the studies, if any. Choose Replace existing tags to overwrite the existing tags.